Redbird, a French drone software company, was recently purchased by Airware, an American drone software company. A few weeks before the sale was made public, Ian and Emmanuel, Redbird’s then-CEO (now VP of AEC at Airware), recorded this podcast episode. Emmanuel and Ian discuss how large mining and construction companies use drones and why they’re important to them. Get a glimpse inside of Redbird as the negotiations for the sale of the company were likely well underway. [00:00:00] IAN SMITH: This episode of Commercial Drones.FM, features co-founder of Redbird, Emmanuel de Maistre. Between the time of recording and now however Redbird as a company was actually bought by Airware. When this interview took place the news was completely unknown to both myself and the public. But either way this episode gives some great context into what Airware’s strategy may have been for purchasing red bird and what Redbird as a company had been working towards in the mining industry aggregates and construction. So it gives some really nice insight into what may have been going on behind the scenes and now that we know this information it’s a little bit more juicy and interesting to listen to this interview. [00:00:42] So thanks again for joining Emmanuel. Best of luck in the new venture. Congratulations on the sale of the company and enjoy your new role Airware. Enjoy the rest of the show. [00:00:56] [Introduction] Welcome to Commercial Drones.FM, the podcast that explores the commercial drone industry. The people who power it and the concepts that drive it. I’m your host Ian Smith. 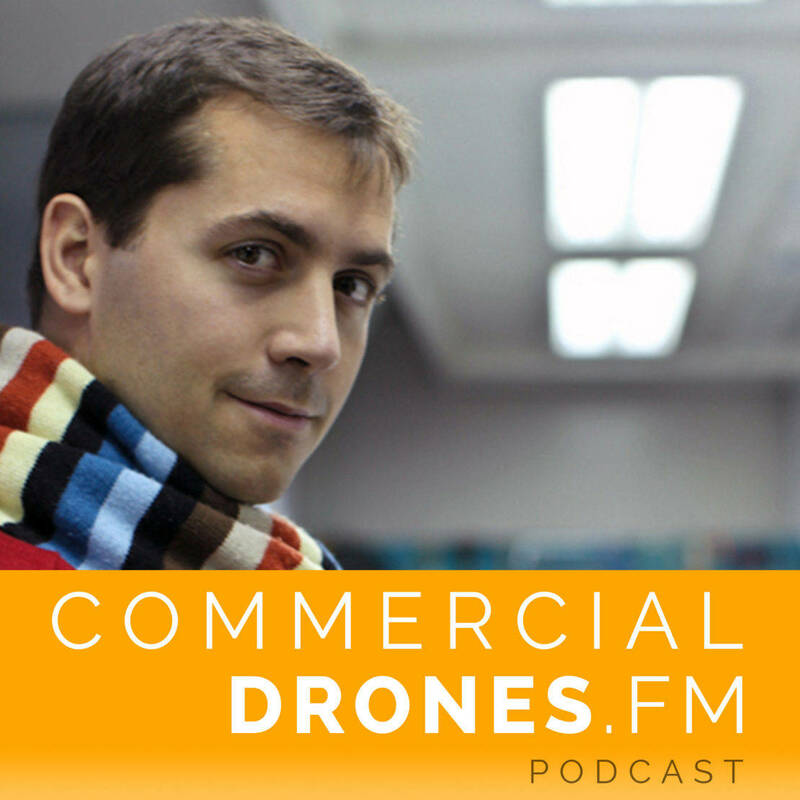 [00:01:06] IAN SMITH: Hey everyone welcome to Commercial Drones.FM. Today I’m sitting here in San Francisco with Emmanuel de Maistre who is the co-founder and CEO of Redbird a French drone data company and he’s also the founder and chairman of the French commercial drone association or FPDC. Redbird has offices in Paris and San Francisco and Emanuel has been in the drone industry since 2012. Welcome to the podcast. [00:01:38] EMMANUEL DE MAISTRE: Thank you very much Ian. [00:01:39] IAN: Thank you very much for being here. First things first, can you describe Redbird to somebody who might not know what it is? [00:01:46] EMMANUEL: Yeah. We’re basically drone data analytics company which means we will develop a cloud software for processing the drone data but also for extracting the key information and reports that our customers are looking for and that we have a specific focus on construction, mines, quarries and some heavy industries. [00:02:09] IAN: Excellent cool, so we’ll dive into that a little bit later on. But first of all your background actually isn’t didn’t really start in drones. Where did it begin? [00:02:21] EMMANUEL: I was a biotech engineer at the beginning and they used to launch a high tech startup which I sold actually a few years ago and because I had a bit of time first in a book and money. I became a private pilot for the fun of it and I got this pilot license in 2012 which is exactly the same year where we had a new drone coalition published in France and that’s how I started to have a look first in drones. I understood it was like open and the regulation was opening a new market and that was a very interesting industry to begin a new startup. [00:02:56] IAN: So just for some context, we met in France whenever I was working for Delaire Tech in Toulouse and you guys at that time it kind of started as a drone service company and it looks like you’ve kind of had some evolutions as time has gone on. Maybe you can tell us about, how the company Redbird has has advanced in the past years. [00:03:20] EMMANUEL: Sure. Well yeah. Most tech startups evolve Of course in terms of the business model and strategy. In our case we used to buy and fly drones so we used to do kind of service for one year. But one of the reason for that was also to discover the needs of the customer and what the people were able to do is draw on data. What we discovered is that construction and mining was obviously a very interesting space in terms of customer need market maturity. Plus we also met and worked with a caterpillar dealer in France. That definitely helped us to develop a very nice and dedicated product in that industry. [00:03:58] IAN: And so why did you choose San Francisco out of all cities to expand in the United States? What about San Francisco attracted to you here? [00:04:05] EMMANUEL: Well it’s it’s a nice city obviously but it’s also the place where most of the investors in the U.S. are and are active and because we are raising money. And we will continue to raise money probably. I think it was very good for us to stay close to the financing ecosystem. As a consequence also San Francisco is the definitely the core of the Redbird. The core of the drone industry with dozens of drones startups and it’s very nice to meet other drone entrepreneurs and partners. [00:04:34] IAN: Agreed Yeah. Good to see you here. So you have a pretty important partnership going back with Caterpillar. This is a very unique partnership as far as it goes with the current state of the drone industry. Can you tell us a little bit about just what you guys do together? I mean what was the what was the purpose of this partnership? [00:04:56] EMMANUEL: Well it’s a long story but to summarize it shortly I would say it’s a commercial partnership it’s a sales and marketing partnership first and we have some kind of technical partnership where we could develop a product together. But it’s important to understand that Caterpillar is making a big push in digital and that drone data is going to be used by the caterpillar customer and by the caterpillar dealers a lot. So as he’s trying to sell solutions rather than just machines they need this. They need drone data as part of the entire package that they will sell very soon. [00:05:38] IAN: So there’s a lot of sensors. If I’m not mistaken like inside those machines how much does one of those excavators cost? [00:05:46] EMMANUEL: Well it can be from a million to, for some of the machines several million U.S. dollars. [00:05:51] IAN: OK. So whenever you buy one of those if you’re a construction or a mining company number one you expect the darn thing to work. Number two you want to make sure that you can I guess maximize the output of it. So are you saying that the drone is just kind of like kind of augment these machines on the job site and and just really kind of take it to the next level. [00:06:14] EMMANUEL: Absolutely well, when you buy a machine you have to make sure and you will have the highest productivity with that machine because it’s very costly to acquire. It’s costly to operate and drawn to data perfect tool and the perfect sensor to frequently monitor the prediction that is happening on the construction site or on the mining site or even a quarry. [00:06:36] IAN: And so there’s sensors inside these machines as well that are providing data. Are you guys tying into those sensors for providing these analytics for the mining and construction companies? [00:06:48] EMMANUEL: We do, and I would say we were in basically interested in any kind of data on the job site or on the mining site. It’s very interesting to see how many data is generated on the site today but how it’s it’s it’s definitely poorly managed to do as well. And it’s interesting to see for example we just announced a few days ago that partnership was an explosive component. These guys drill and blast rock on mines and quarries and generate data. Why don’t we take advantage of that data and combine it with the terrain data which is acquired by drones. [00:07:25] IAN: How do you mean? So you blow some stuff up and then you make sure that they blew it up correctly? [00:07:33] EMMANUEL: Absolutely, it’s probably not something a lot of people know but explosives are expensive expensive and you have to drill and blast the right way for the machine to process the blast efficiently. [00:07:47] IAN: Gotcha. OK. So Wired Why are these companies blasting? What is the purpose of them? What are they blowing up here? [00:07:53] EMMANUEL: They are blowing rock and rocks basically and rocks are going to be processed into aggregates or they are going to be processed to extract some minerals and ore.
[00:08:02] IAN: So an aggregate is like the stockpiles, things like that. [00:08:06] EMMANUEL: Correct, sand, rock. Agreed. [00:08:07] IAN: Great Interesting. OK cool. And so yeah I keep up with you on social media and everything and I always see pictures of you out in some location usually in the middle of nowhere on a huge mine. So what what are you usually doing out there on those mines and quarries? [00:08:28] EMMANUEL: It’s probably like when I’m on a mine or I’m on the job site it’s probably to meet the customer of course. And it’s also easy to make a demo. It’s very interesting to see that a lot of customers today are asking for the most. Are definitely in the right time in terms of customer traction. I mean convincing and signing customer is usually to make some kind of testing with their own data. [00:08:54] IAN: And what do you see their reaction to these drones are? I mean is it mostly positive or is it neutral at first are they skeptical? [00:09:02] EMMANUEL: I would say it’s incredibly positive, but I would I would say as well that what makes the deal is definitely the data and the software and I would say everybody has been discussing about drones for years. But no one has found he has found that yet the way they will they will manage the data and the right way to sign a customer is to show them the best data processing and data analytics solution. [00:09:30] IAN: And what are some of those kinds of like pieces of data like what are the big things that make them very happy? Maybe I can twist the question a little and whats like maybe a use case like what’s a scenario? where in the past it was very difficult to accomplish or unsafe or expensive or time consuming. And now Redbirds software is helping the customer just make that way better. [00:09:54] EMMANUEL: Yeah we could we could speak about for example productivity. All these machines are lets say burning fuel and are moving on the sites. And one of the features of the software that we developed is a way to make sure that the site is properly designed to ensure the highest productivity and the lowest fuel consumption to do such a study before you needed to send a guy for. Let’s say one or two weeks on the sites. And it was long it was expensive and it was very unsafe as well. We have other features although that it about safety for example. Were able to tell a customer if the site is compliant or not with the regulation especially the regulation its like mining health and safety authority. And the customer definitely wants to see if some places, some location are a breach of regulation. [00:10:51] IAN: Gotcha. And so you were saying something about the design of the site can play a big role in. Like was it fuel consumption or something. Yep so you guys can do some analytics by flying the drone over and then optimizing it? [00:11:05] EMMANUEL: Absolutely yeah, at least we give the information to the customer and it’s up to the customer to take a decision. So that’s why we like to compare data and decisions and decision will lead to increased productivity. [00:11:19] IAN: Data driven decisions. There we go. That’s awesome. Very very really interesting stuff. I’ve been tracking what you guys have been up to with that. And I always found it very fascinating. So it’s good to be able to share it on the podcast here. What about construction industry? Is it similar to mining or do you think that they’re having an entirely different set of problems that you guys help them solve? [00:11:46] EMMANUEL: It’s definitely I would say it’s definitely different from mining. First they will fly on smaller sites but they will fly more frequently. And I definitely expect most customers and customer to fly every day very soon and I definitely hope that drone will be able to fly to numerously one day. [00:12:04] IAN: So human. No set up whatever it just kind of takes off. [00:12:07] EMMANUEL: That will come. That’s for sure. Maybe not everywhere but in every country that that we’ve come for sure. So data will be generated. And instead of going on the site every day and meeting physically in the room every day. Drones will acquire date on the job sites and this data will be shared daily to the people on the site. The superintendent, the the customer himself etc. [00:12:31] IAN: What do you think about a really quick kind of tangent here. So the other day I was playing around with some virtual reality gear. Have you ever tried like the Oculus the other HTC vibe? Drones can make 3D models with photogrammetry do you first see like in a not so distant future. Can you imagine a construction or mining team or a site using virtual reality or augmented reality? [00:12:57] EMMANUEL: Yeah and its already the case. [00:13:00] EMMANUEL: Well in some cases and I’ve heard some Caterpillar products or maybe a product made of augmented reality gears and augmented reality software and that’s maybe to manage the to site and maybe or so to maintain the machine and so many use case will be around VR on the site. [00:13:20] IAN: Cool yeah. I can just imagine I mean Google Glass like kind of had a failure because they targeted it towards consumers but I think they’re revamping that and targeting it more towards maybe enterprise. So it makes sense like how often when you’re on the job site are the the workers and the folks on the site wearing like protective glasses. [00:13:43] IAN: Yeah and so why not just throw like a little augmented reality screen. OK.
[00:13:48] EMMANUEL: That’s a new idea for a new start up for the people that are listening to the podcast, yes right? [00:13:53] IAN: Yeah we’ll take a few percentage points of equity on that. Awesome. So yeah that integration and your partnership with caterpillars is pretty incredible. What about safety? You know having drones on the worksite the job site for construction and mining. You mentioned safety before I saw on your really nice new website there’s a section on it about increasing safety. So how are drones and how is Redbirds software helping companies in construction and mining companies increase safety on the job sites these days? [00:14:29] EMMANUEL: So flying a drone would be safer because people won’t have to. Let’s say a walk on the sites where it’s sometimes very dangerous especially when the shareholders have to work on stock piles. They have to get quite close to the court cases and sometimes machines are very dangerous as well on the site. But the other part is that we can use drone data especially processed and used data to identify some safety related analytics. And one example are the safety blocks and safety berms that are some specific blocks displayed on the road. They must stick to certain criteria. [00:15:10] IAN: This is on a mining on a miner. [00:15:13] EMMANUEL: Mine or quarry, they must be high enough, the software the software can detect whether a safety block and a safety berm is high enough vs the regulation. And that will give any information to the site manager maybe to fix some safety blocks and safety berms and maybe avoid some very heavy fines. [00:15:36] IAN: Excellent. So your software is very very specialized. I just want to point that out so there’s a lot of different. You know it’s all cloud based right? [00:15:45] IAN: OK. So there’s a lot of other different cloudbase software is out there. It seems like some of them kind of do some specialization and some are a little bit more general so I really like the approach that you guys have taken really focusing on safety for construction and mining. What’s your so if we turn the tables a little bit if I went and ask one of your customers about Redbird and I said what’s your favorite thing about it what would you think some of them would say? [00:16:12] EMMANUEL: User friendliness it’s. It’s impressive to see how easy how easily the customer can use of software especially in the US in that industry construction mining especially construction and quarries have not been used to software that much. It’s a very conservative industry. They are adopting technology quite late compared to other industries. So we need we definitely need to develop and to propose a very easy to use easy to understand software. And the second thing they love is collaboration because it’s easy anyone can connect and very quickly understand what’s going on on the site with even no expertise in data. And that’s what’s so unique brand new in the in the construction industry. [00:17:01] IAN: Perfect, collaboration that’s all about it’s all about making it easy to move around and easy to look at. So what’s your favorite part about working in the mining and construction industries? [00:17:12] EMMANUEL: It’s it’s very impressive and amazing to bring a new solution in an industry that has no solution yet. Drones getting drones are going to be used on every single mine every single quarry every single job site in the world. But the penetration rate so far is very very low. And so we have an opportunity together with other companies today to define to establish the standards. And that’s a unique opportunity for an entrepreneur. [00:17:42] IAN: I dig it. So La Federation Proffesionel de Drone Civil, the FPDC or the French commercial drone Association. Tell me a little bit about how you decided or got into founding that that association. [00:18:06] EMMANUEL: So that was in 2013 three years ago where a few drone companies in France met each other and especially the Delairtech, Redbird and two other companies a manufacturer and the service providers. We knew that the Civil Aviation Authority were to update the regulation and we felt we had to kind of discuss together to make sure the new regulation was to be a good one and then the appropriate one. And so thats why we started FPDC with 4 companies. It went well. We had 400 members in 18 months gathering small companies, big companies, some research universities and so on and it still going quite well. I’m not actively involved because I’m in the U.S. but I know every European country has an association and and they are discussing together to harmonize the European regulation. [00:19:06] IAN: Why is France so far ahead in regulations compared to the U.S.? like things like beyond visual line of sight which we kind of chatted about a little bit earlier Why is that? Like you know you always I mean since I lived in France I kind of experience it. A lot of times it’s just not leading the way in technology. And how did this happen or why did it happen. What do you think? [00:19:33] EMMANUEL: So for reasons we may not need the way in every technology but we are good a position we have a small company called Airbus in Toulouse France. So we have some engineers in the innovation and aerospace and some data engineers as well. We have Parrot which is a French company that released the AR drone six years ago. [00:19:55] IAN: So those little iPhone controlled one,six years ago. [00:19:58] EMMANUEL: Six years ago you could fly in your apartments and so the French people started to hear about drones at Christmas, six years ago that was eartly and that the the positive the opinion of the public was very positive about drones. So I think it was one of the one of the reason we had the nice development of the markets and of course the regulation which was very well the beyond visual line of sight and operation over populated areas with cities. So it has been amazing how French companies have been testing your skills. And we we well I hope France will stay dead in the drone industry. But what I’m seeing so far is a lot of other countries catching up. And the first one being the U.S. with a very nice new Part107 regulation which will probably make the market explode. [00:20:59] IAN: What do you think about Part 107? How do you what do you think about the the the allowances that they’ve kind of built in there? You know things like the inspection provision there so you can fly 400 feet above the top of a structure as long as you’re within 400 feet of it. You know some of the other ones like allowing a someone in a rural area to operate from a moving vehicle as long as they’re not operating the moving vehicle and the drone at the same time. What do you think how do you think the U.S., the FAA did in listening with the feedback? [00:21:33] EMMANUEL: Well so far my understanding is that that part when a sovereign regulation is better than French regulation except it’s beyond visual line of sight capabilities. So I feel even though it has to be improved always and hopefully very frequently. But you well you the U.S. now has the perfect regulation to grow the market for at least the most simplest use cases. Like agriculture construction maybe inspection as well. And a few other use cases. [00:22:05] IAN: How important do you think beyond visual line of sight is? I mean do you think that’s the next I guess step that the U.S. could take an increasing capability? [00:22:18] EMMANUEL: That’s one of the next step. I would say it’s a very important next step but I would say the market is not ready yet for beyond visual line of sight. Customers like utility companies had way companies power online companies are very interested in drone technologies but not quite ready to buy into scale. So I think one of the very important next step is traffic control for drones all sharing the traffic information. So some kind of unmanned traffic management system which I mean the U.S. will invent first before Europe. [00:22:50] IAN: So are you planning on taking the part 107 test when it’s released. [00:22:53] EMMANUEL: I do. And since I’m a pilot the radio will probably go for the on line test even faster and will be even easier. [00:23:01] IAN: Totally. And I noticed on the new Web site I was just kind of searching around it looks like you guys have 14 jobs on the Web site so hiring and growing pretty aggressively. Maybe you can tell us a little bit. Some people might be interested that are listening to the podcast and might want to get into the drone industry what kind of people or positions are you looking for to join the RedBird team. [00:23:24] EMMANUEL: We are looking mostly for sales marketing and business development people and we are mostly looking at hiring them in the U.S. or in North America to catch up with the markets there and we still continue to invest on the software of course. But that will be more people that be behind in Paris whether the I.T. teams still based and would be based. [00:23:46] IAN: Great. And last question What is your favorite drone? [00:23:51] EMMANUEL: The drone that the customer prefers. We’ve seen a lot of DJI data obviously. Yeah. A mix of DJI drones like Phantom 3,4. Inspire 1 Matrice now but since customer fly on larger areas like construction and mining sites, fixed wing drones are being used a lot especially the drone which we feel is a very nice drone. Also I think I hope I hope some bigger drone will be released soon to cover even larger areas. [00:24:26] IAN: That’s right. Hopefully the regulations support that. One thing actually to note is that dronedeploy just released a report and it kind of goes along with yeah there’s so many DJI drones that are out there and being operated because they’re so easy to get into. And less sense fly like EB, fixed wing kind of drones. But those are excellent platforms and should not be discounted. I think it’s just a matter of, you know the gateway drug being like the DJI phantoms and things like that they’re just so affordable. So that’s just a little point to note. [00:25:01] EMMANUEL: And the sensors are good enough for the accuracy the customer are looking for. And that’s what the customer always is waiting for accuracy in X Y and Z of. [00:25:13] IAN: If you add ground control points and you compare one drone to the next one could cost twenty thirty thousand dollars the other could cost 1500 bucks and all of a sudden if you’re looking for accuracy the values are going to be exactly the same. Well everybody thank you so much for listening. [00:25:31] If you would like you can go ahead and follow Emmanuel on Twitter to keep up with his adventures on all the different mining and construction sites around the world at @emmanual_2m. And then you can follow Redbird on Twitter @RedbirdHQ and check out their Web site. GetRedburn.com. You can follow a commercial drones FM, the podcast on Twitter @dronespodcast and @Facebook.com/dronespodcast. If you like what you’re hearing. Leave us a review on iTunes and subscribe. We’ll be back with more episodes any last parting thoughts Emmanuel? [00:26:15] EMANUEL: Well I’ll be very much interested in meeting or discussing with any auditor of course especially the ones that are living in San Francisco. It’s a fantastic industry to work together to make it even nicer and better. Thank you very much. [00:26:32] IAN: Well go ahead and hit up Emmanuel if you’re interested in getting in the drone industry. So thanks everyone for listening. We’ll go ahead and catch you on the flip. Cheers.